The massive fail followed a series of celebrity hacks on Twitter this weekend. Remember when you hacked a celebrity's Twitter account pretending to be them, only to realise they'd been dead for almost 15 years? No? Us neither. But according to The Daily Beast, the man behind the hacking of George Harrison's account didn't know he'd sadly passed away from cancer, aged 58, in 2001. 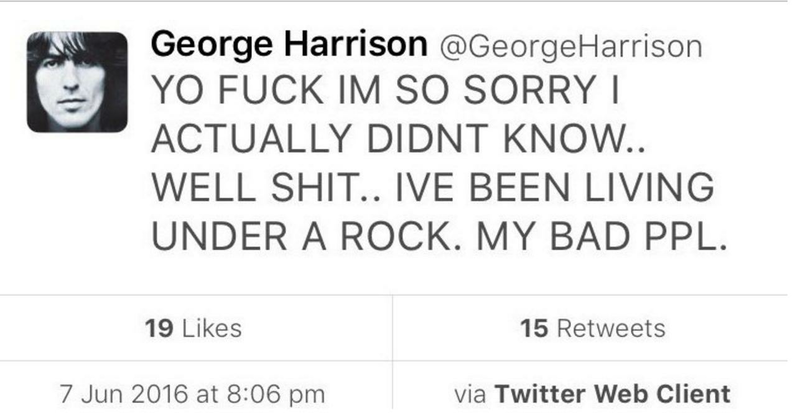 The hacker, who went by the name J57, admitted to breaking into the late Beatles star's Twitter yesterday, before realising he died long before Twitter was even invented. The bio in the account for Harrison's estate is said to have been changed to read: "Hey George, follow @j5zlol when you see this and shoot me a DM. I’ll help you secure your accounts :) I don’t want to cause you any harm, bud” . However soon after, the hacker wrote "my bad" before admitting he's "been living under a rock". The prank follows the hacking of several musicians' Twitter accounts this weekend, including those of Katy Perry, Sonic Youth, and most notably Tenacious D - who were hacked by someone who claimed Jack Black had died. Speaking to The Daily Beast, the hacker - who claimed he also gained control of Keith Richards, Tame Impala, and Bon Iver's accounts - said: “I’m just doing it to prevent that from ever happening in case someone who knows how to do it comes along and possibly does some damage." However, celebrities need not beat themselves up too much, since - according to reports - Facebook founder himself, Mark Zuckerberg was hacked on Pintrest and Twitter, which reportedly had "dadada" as a password. Naturally, people found the irony in the biggest name in social media having such an easy password, and they let their feelings about it known on Twitter. If Facebook ever tells me my password is 'too weak' again when Mark Zuckerberg has 'dadada' as his, I will burn my laptop. And then his.